NEWTOWN, Conn. — More than eight out of ten Americans say that the misuse of guns in violent crimes is a matter for the criminal justice system, not a public health issue, and that the Centers for Disease Control (CDC) should not spend resources on the study of “gun violence” but instead concentrate on viruses and disease. These findings are among the results of a national scientific poll of 1055 likely voters conducted live by telephone Sept. 30-Oct. 2. 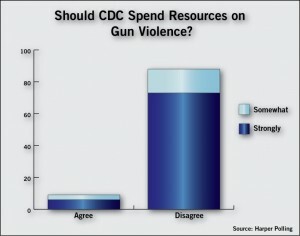 The National Shooting Sports Foundation (NSSF) commissioned this survey to determine whether adults share the view of some gun control organizations and activists that the use of guns in crime, for which they use the short-hand “gun violence,” is a public health issue.